Samsung's concept glasses project your PC display onto a pair of glasses. Sure, technology concept videos showing off visions for the future are fun, but concept products you can actually touch and use are far more interesting. Next week at Mobile World Congress, Samsung’s bringing an interesting concept product that’s kind of a mash-up of Google Glass and Microsoft’s HoloLens—similar to ODG’s prototype glasses we spotted at CES in January. Samsung’s “Monitorless” wants you to use a pair of augmented reality glasses in lieu of a computer monitor. That basic concept isn’t particularly revolutionary as Microsoft’s HoloLens can stand in for a PC monitor, as can VR headsets such as the Oculus Rift. But Samsung’s Monitorless glasses look more like a regular pair of specs. Just as interestingly, Monitorless pulls double duty as both an AR headset or a quick and dirty VR setup, allowing you to see either your PC desktop or your smartphone’s display in either a virtual reality (VR) or augmented reality (AR) experience. Monitorless will participate in MWC’s 4 Years From Now (4YFN) showcase. Based on the product art and video, Samsung’s Monitorless glasses look like a pair of high-quality 3D glasses. The device’s bulky arms hide its key components including the CPU, Wi-Fi chip, visual projector, battery and speaker. There’s no word on any of the specifics of those components. The arms appear to have the added benefit of blocking out your peripheral vision, which makes whatever you see in front of you more immersive. Pick up the glasses and you’ll see there are actually two sets of lenses. Standard glasses lenses sit in front. Behind that, however, are two smaller optical lenses that look similar to Google Glass or the HoloLens. The optical lenses display the interface, while the transparency of the front lenses can be adjusted for either complete VR immersion or a more AR-like experience where the outside world is fully visible. The glasses connect directly to your smartphone via Wi-Fi Direct, and the phone connects to a PC via Wi-Fi or LTE and then relays the PC interface back to the glasses. Once you’re connected to your PC, you can interact with a program or a PC game. 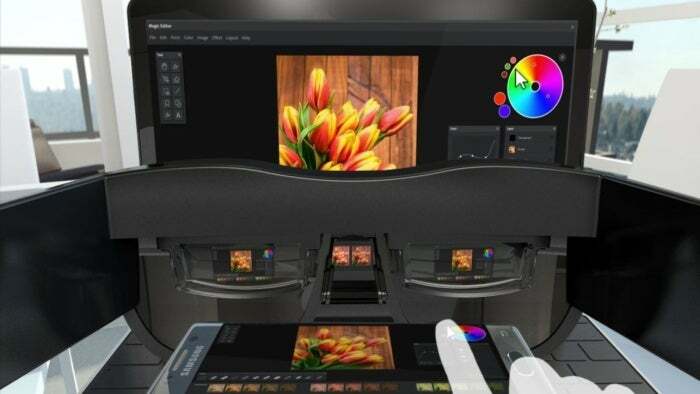 Samsung’s concept video suggests you use your smartphone as a remote control to interact with your PC, but presumably you can use a traditional keyboard and mouse as well. The impact on you at home: It’s not clear if Samsung intends to make Monitorless a reality or if this is just an idea of what the future could be. Hopefully we’ll get some hands on time with Monitorless during MWC (assuming it’s in working order) to see what the current experience is like. Are there any latency issues with gaming, for example? And how does Monitorless compare to Microsoft’s HoloLens? 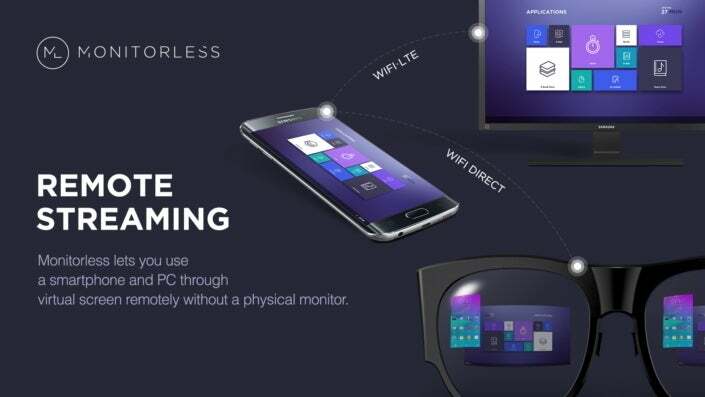 Monitorless is one of four product concepts Samsung is bringing to MWC. The others include Relúmĭno, a visual aid app for Gear VR; VuildUs, a VR program for home interior decorating; and traVRer, a VR-based travel experience.